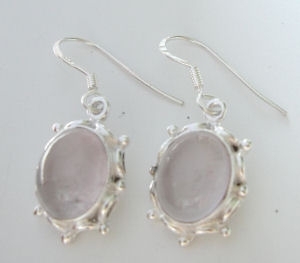 Gorgeous pair of earrings with lovely moonstones. These earrings are a lovely 12mm oval shaped and are a super milky luminous moon colour and the stones are surrounded with gorgeous shiney silver with a really pretty bobbly pattern. These earrings have a really girlie feel to them. Moonstones are a protection stone, used for land & on the seas. Stone of the goddess Diana, considered to bring love and passion to a relationship.